We are building more new homes next to excellent transport connections. 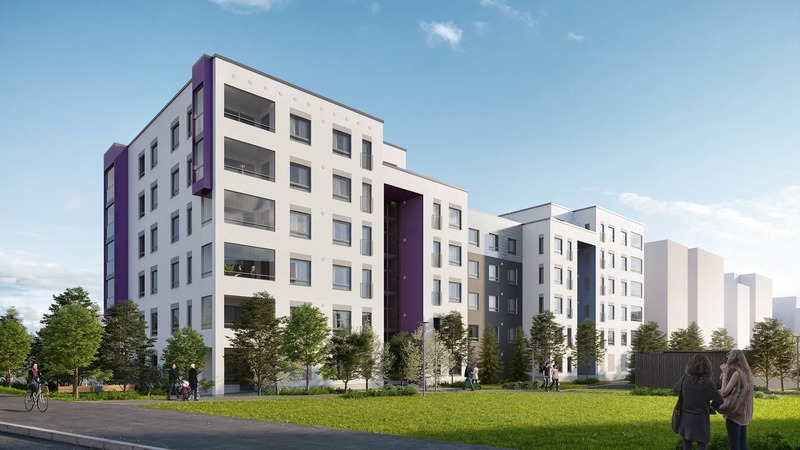 Hortensia’s light-filled homes will be located on the southern edge of the block’s shared park-like inner courtyard, just a couple of minutes walking distance from the railway station. By taking a train at the nearby Ring Rail Line station, it only takes a moment to reach the Helsinki Airport and Tikkurila. It takes approximately 25 minutes to reach the central railway station in Helsinki. Koivukylä with its large supermarkets is only 1.5 kilometres away, and it is just a short drive to the Jumbo shopping centre and the Flamingo entertainment centre.In the neighbourhood, you can find, for example a grocery store and several day-care centres. In Leinelä, Vantaa, environmental art and nature are an integral element of smooth everyday living. You can find great outdoor recreation areas and ski tracks nearby. Learn more about the area. Hortensia’s apartments are full of light and feature a light colour scheme, as well as high-quality equipment and furnishings, such as beautiful boarded parquet floors and modern domestic appliances in the functional kitchen. The glazed balconies are spacious and the 1st floor apartments have both a balcony and their own yard! Some apartments have their own saunas and Hortensia also has shared sauna facilities. The parking spaces are located in the parking garage.